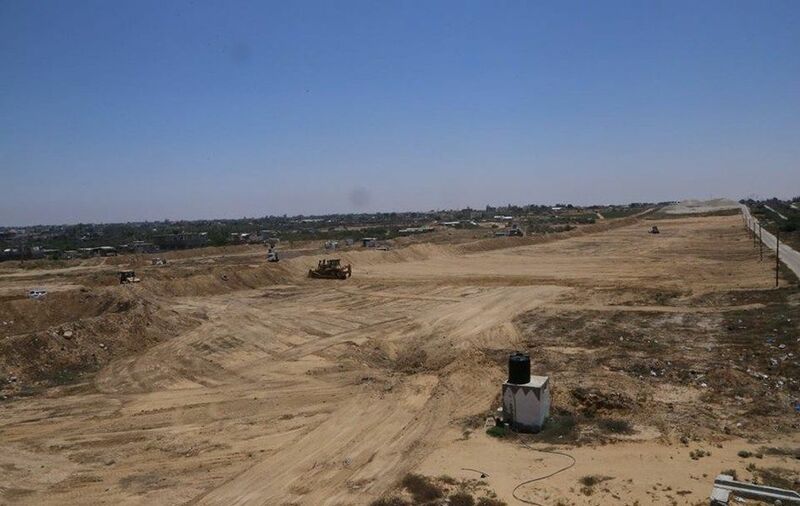 The Hamas government has begun work on a 12-kilometer-long buffer zone along Gaza’s southern border with Egypt, according to a statement released by the Hamas Interior Ministry on Wednesday. The move to create “a closed military zone,” which includes “paving a road overlooking the southern border … and creating an electronic monitoring system,” was framed by the Hamas statement as aiming to prevent the infiltration of wanted militants and drug traders. Hamas Interior Minister Tawfiq Abu Naeem stated that the move is a result of the recent rapprochement between the two governments that was broached when a Hamas security delegation met Egyptian authorities in Cairo earlier in June. Naeem was part of that security delegation that visited Egypt, which also included the movement’s leader in Gaza Yehia Sinwar and leader of the Qassam Brigade, Hamas’s military wing, Rawhy Moushtahy. The discussions in the meeting reportedly touched upon a number of topics, including the security situation in Sinai, trans-border tunnels, opening the Rafah border and elements in Gaza wanted by Egypt, according to a Palestinian source who previously spoke to Mada Masr. In mid June, Egyptian security sent the Hamas delegation a list of demands that included a request for extradition of 17 people wanted on terrorism-related charges in Egypt, according to the same sources. Egyptian authorities have accused members of the Qassam Brigade of supporting terrorist activities in Egypt, including the assassination of the country’s top prosecutor Hisham Barakat in June 2015. While neither side has disclosed the names on the list, sources told Asharq Al-Awsat that the Hamas Interior Ministry interrogated them, and it is believed that the interrogation findings were forwarded to Egypt. There have been positive developments in the Egypt-Hamas relationship this year, which began with Hamas political bureau head Ismail Haniyeh’s January visit to Cairo, which was the first visit of its kind since the ouster of Egypt’s former President Mohamed Morsi in July 2013. On June 21, Egypt sent a fuel shipment to Gaza’s only power plant to temporarily mitigate an energy crisis wrought by a payment dispute between the Palestinian Authority and Hamas over Israel supplied electricity which has left the region’s residents with fewer than three hours of electricity per day. In the post 2013 landscape, Hamas was seen to be one of the major Muslim Brotherhood conspirators and was alleged to have been involved a bid to take over Egypt’s Sinai. Hamas was also accused of having a hand in the security vacuum in Egypt during the 2011 revolution, by orchestrating prison breaks and carrying out terrorist attacks. Shortly after Morsi’s overthrow, a court ordered a freeze on all the activities of Hamas in Egypt and another declared its military wing, the Qassam Brigades, a terrorist organization.